For the first time in its 165-year history, the America’s Cup scheduled a special tour leading up to the 2017 America’s Cup races in Bermuda and Cape May’s “Other Side” is on the T-shirt. The tour will make “Port-O-Call” at South Jersey Marina on Schellenger’s Landing on Aug. 30-31. Owner and Capt. Troy Sears and crew will navigate a modern replica of the world’s most famous racing yacht, the America, to sailing coastal communities in the United States, Canada, and Mexico and throughout the Caribbean. “The goal of this tour is to celebrate the event’s storied history and to infuse a new level of excitement and involvement in the America’s Cup for now and for generations to come,” Sears said in a statement. The tour will give sailing enthusiasts and neophytes alike a chance to come aboard an exact replica of the vessel that first won the Royal Squadron’s 100-pound silver cup in 1851. This is the cup that was later decreed to the New York Yacht Club and renamed the America’s Cup after the winning vessel, America. In Cape May the public will be invited to tour the America free between 10:30 a.m. and 12:30 p.m. on the two days that she is berthed at South Jersey Marina. In addition to the dockside tours, two sailings a day will be scheduled, one from 1 to 4 p.m. and the second from 4:30 to 7:30 p.m.
Free America’s Cup multimedia presentations will be conducted from 8 to 9 a.m. on Aug. 30 at the Corinthian Yacht Club and on Aug. 31 at South Jersey Marina. Tickets for the sailings are available online at: www.Fareharbor/yachtamerica. 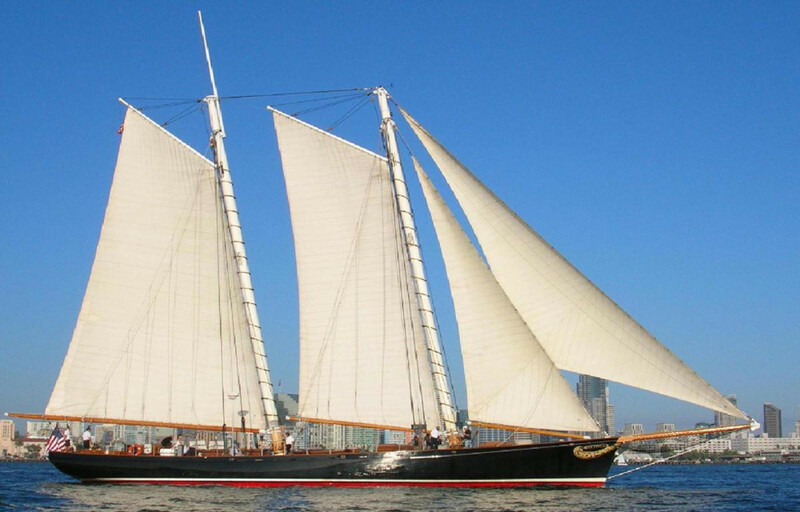 Beginning Aug. 12 and running through Sept. 3, New Jersey’s own tall ship, the A.J. Meerwald, will make an appearance at Utsch’s Marina, also on Schellenger’s Landing. The public will be invited to tour the Meerwald free on Aug. 12 from 4 to 6 p.m. Afternoon and evening fee-based public sails are scheduled for most days between Aug. 12 and Sept. 3. The afternoon sails will typically depart at 1:30 p.m.; evening sails will depart at 5 p.m.
A Pirate Sail, Sailor for the Day and Family Special Sails also will be available. Contact the Bayshore Center at 856-785-2060 for specific costs, reservations and details, or buy tickets online at www.bayshorecenter.org . Hosted by both South Jersey Marina and the Corinthian Yacht Club of Cape May, the America’s Cup visit is part of a nationwide effort to spark renewed excitement in the yachting community about the coming America’s Cup race. The tour also will highlight new technologies that are elevating the sport to the next level.